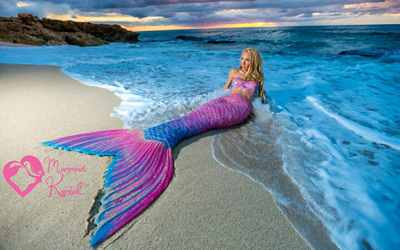 Founded by Mermaid Kariel in Hawaii, Tails of art offer full silicone tails (with the option of individual scales), as well as sequin silicone hybrids. 1. Do not post a review until after you have received you tail, and used it at least once. Otherwise it can not be a true review of the product. If you wish to complain about delays or poor customer service, or post a review after unboxing but before first use, please discuss that in a forum thread. 2. You must provide proof of purchase. Due to abuse of the system, you MUST provide proof of purchase within your review. This can be a photo of you in your tail, or a photo of your tail with a piece of paper with "MerNetwork.com" written on it, placed on or near your tail so it can be clearly seen in the photo. This photo can be embedded (see instructions on how to do so below), or the photo can be linked to via url or hyperlink in the review. If you do not include this, your review will not be approved. If you are having trouble inserting photos, please see THIS THREAD for a tutorial on how to do so. 3. Be respectful and objective. If you have anything negative to say, please refrain from personal attacks on the tailmaker. Discuss the item's color, texture, weight, quality and shipping condition. You also may wish to describe the tailmaker's customer service and delivery time. Describe how it worked in the water, the process of getting it on and off, and other useful information. 5. Be truthful to the best of your ability. Deliberately false or misleading information in reviews will not be tolerated. Be aware that approval of reviews is at the Admin's discretion. If we have reason to believe a review is falsified, we will remove it.